Are novel aryl phosphates competitors for bisphenol A bis(diphenyl phosphate) in halogen-free flame-retarded polycarbonate/acrylonitrile–butadiene–styrene blends? This article was published in European Polymer Journal, 03 July 2012. The reactivity of the flameretardant and its decomposition temperature control the condensed-phase action in bisphenol A polycarbonate/acrylonitrile–butadiene–styrene/polytetrafluoroethylene (PC/ABSPTFE) blends. 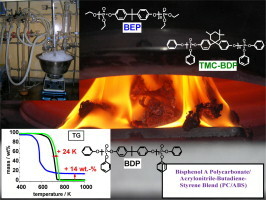 Thus, to increase charring in the condensed phase of PC/ABSPTFE + aryl phosphate, two halogen-free flameretardants were synthesized: 3,3,5-trimethylcyclohexylbisphenol bis(diphenyl phosphate) (TMC-BDP) and bisphenol A bis(diethyl phosphate) (BEP). Their performance is compared to bisphenol A bis(diphenyl phosphate) (BDP) in PC/ABSPTFE blend. The comprehensive study was carried out using thermogravimetry (TG); TG coupled with Fourier transform infrared spectrometer (TG-FTIR); the Underwriters Laboratory burning chamber (UL 94); limiting oxygen index (LOI); cone calorimeter at different irradiations; tensile, bending and heat distortion temperature tests; as well as rheological studies and differential scanning calorimeter (DSC). With respect to pyrolysis, TMC-BDP works as well as BDP in the PC/ABSPTFE blend by enhancing the cross-linking of PC, whereas BEP shows worse performance because it prefers cross-linking with itself rather than with PC. As to its fire behavior, PC/ABSPTFE + TMC-BDP presents results very similar to PC/ABSPTFE + BDP; the blend PC/ABSPTFE + BEP shows lower flame inhibition and higher total heat evolved (THE). The UL 94 for the materials with TMC-BDP and BDP improved from HB to V0 for specimens of 3.2 mm thickness compared to PC/ABSPTFE and PC/ABSPTFE + BEP; the LOI increased from around 24% up to around 28%, respectively. BEP works as the strongest plasticizer in PC/ABSPTFE, whereas the blends with TMC-BDP and BDP present the same rheological properties. PC/ABSPTFE + TMC-BDP exhibits the best mechanical properties among all flame-retarded blends. Filed under: Flame Retardant, Magazine |	Comments Off on Are novel aryl phosphates competitors for bisphenol A bis(diphenyl phosphate) in halogen-free flame-retarded polycarbonate/acrylonitrile–butadiene–styrene blends? The report “Flame Retardant Chemicals Market by Type, Application & Geography – Market Estimates up to 2017“ published by MarketsandMarkets , defines and segments the global flame retardant chemicals market with analysis and forecasting of the global volumes and revenues for flame retardant chemicals. It also identifies driving and restraining factors for the global flame retardant chemicals market with analysis of trends, opportunities, winning imperatives, and challenges. The market is segmented and revenues are forecasted on the basis of major geographies such as North America, Europe, Asia-Pacific, and Rest of the World (ROW). The key countries are covered and forecasted for each geography. Further, market is segmented and revenues are forecasted on the basis of applications and product types. This review was published on 13 Jul 2012 in Journal of Materials Chemistry . One of the methods to reduce the flammability of polymeric materials is the incorporation of layered double hydroxides (LDHs) into the polymer matrix. Dispersing LDH into the polymer matrix results in the formation of nanocomposites with significantly improved thermal, fire retardant, optical, electrical and magnetic properties. In this review the focus is mainly on the dispersion of LDH within the polymer matrix and how the dispersion affects the fire retardant properties of polymer/LDH nanocomposites. This document is part of continuing efforts by the U.S. Environmental Protection Agency (EPA) to understand the scientific issues and information gaps associated with nanotechnology, consistent with recommendations in the U.S. EPA Nanotechnology White Paper (2007) and U.S. EPA Nanomaterial Research Strategy (2009a). While no national or international consensus definition yet exists for nanomaterials, a current working definition is a material having at least one dimension on the order of approximately 1 to 100 nm (NSTC, 2011). Materials are intentionally engineered at the nanoscale to exploit the unique or novel properties that can arise from their small size. The Efra Newsletter N°3 and Pinfa Newsletter N°21 Summer 2012 edition are published. Article Publication Date : July 6, 2012 in Ind. Eng. Chem. Res. novel nitrogen-phosphorus flame retardant, 2-carboxyethyl(phenyl)phosphinic acid melamine salt (CMA), was synthesized by the reaction of 2-carboxyethyl(phenyl)phosphinic acid with melamine in aqueous solution, and it was characterized by Fourier transform infrared spectroscopy (FT-IR), nuclear magnetic resonance (NMR), inductively coupled plasma-atomic emission spectrometry (ICP-AES), elemental analysis and thermogravimetric analysis (TGA). Halogen-free flame-retardant flexible polyurethane foams (FPUF) were prepared successfully by using CMA as a flame retardant. The effects of CMA content on the mechanical, thermal and flame-retardant properties of FPUF were investigated by tensile test, TGA, limiting oxygen index (LOI), flame propagation test (Cal T.B. 117A-Part Ι standard), and cone calorimeter. The foam morphology of FPUF was studied via scanning electron microscopy (SEM). The results showed that CMA endowed FPUF with good flame-retardant properties. FPUF containing only 12 wt% CMA can pass Cal T.B. 117A-Part Ι standard and its LOI value was increased from 18.2 (for FPUF without CMA) to 24.1. Particularly, the addition of CMA almost did not decrease the mechanical properties of the resulting flame-retardant FPUFs.